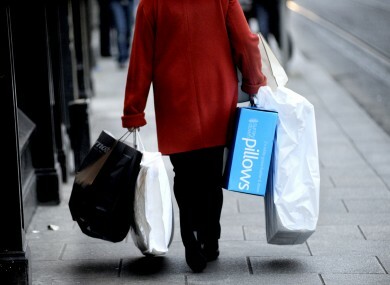 FIGURES SHOW IRISH consumer’s fears may be easing with an increased volume of retail sales in July and the highest consumer sentiment level in almost five years this month. The Central Statistics Office (CSO) reported the volume of retail sales saw a monthly increase of 0.7 per cent in July with sectors like clothing, hardware and fuel reporting growth in sales of over three per cent. Though the monthly figures may have increased, there was an annual decrease of 1.5 per cent. The KBC Bank Ireland/ESRI Consmer Sentiment Index for August put sentiment at its best level in almost five years. The index rose to 70.0 in Augusts from 67.7 in July which represents the seventh monthly increase in the past eight months. This puts the index levels back at those recorded before the economic downturn fully took hold. Chief economist at KBC Bank Ireland, Austin Hughes said he believes the improvement in sentiment is “primarily driven by an easing in fears rather than by a radically more positive view of either the outlook for the Irish economy or consumers’ own finances”. Hughes said consumer sentiment in Ireland is not driven by global factors as sentiment among Europe’s consumers continued to sour in August while improving here. “This would tend to suggest it has been driven primarily by domestic influences,”he said. KBC looked at responses before and after Ireland’s Katie Taylor secured our first gold medal in the Olympics to see if the ‘feel good’ factor might have influenced results. Responses were marginally better after that date but it seems Irish consumers were just generally jolly this month. Consumers’ were also more optimistic about the prospects for their personal finances in the year ahead reflecting the impact of the ECB interest rate cut last month. Hughes said there is some risk that expectations in regard to household finances could be vulnerable due to “the nature and scale of painful adjustments that could feature in Budget 2013″. Email “Retail sales and consumer sentiment up in July, August”. Feedback on “Retail sales and consumer sentiment up in July, August”.